How are your Ecuador travel plans? Are you looking for great attractions, tips and recommendations? The best cultural and food experiences? Great – you’ve found the right place! Since we moved to Ecuador we’ve traveled much of the country (and we are working on the rest of it). We write about Ecuador travel from the perspective of a young family. We travel safe and like to sleep in a comfortable bed at night. And while a little luxury is nice, it isn’t necessary. Sometimes we travel in our own car – other times we let an agency take care of all of the details. Our goal is to see each place as it really is. To experience the culture and the local flavor. And to take lots of photos/videos. Do you want to improve your travel photography? Our site is for anyone planning on visiting Ecuador. If you are going to live in Ecuador, then you’ll have even more time to explore this amazing country. As you plan your trip, you’ll want to know about these 23 Ecuador holidays. They can clog public transportation and fill hotels around the country. Where Do You Want to Travel in Ecuador? 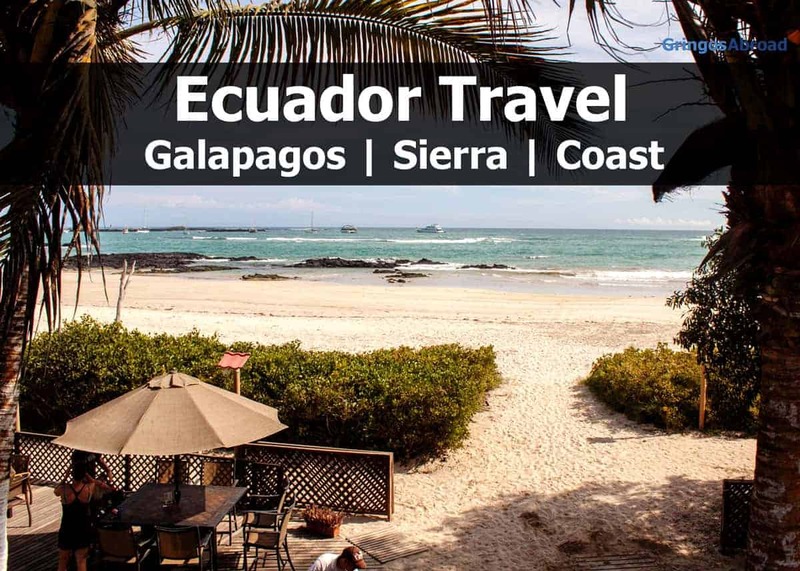 In this article, you’ll learn about the Galapagos, Quito, Cuenca, Salinas and Guayaquil. At the bottom of the page, we also cover Ecuador food and animals. We have lots content planned. Why not subscribe to our weekly newsletter and keep up to date on all the new content? There is no question that, of everything we’ve done in Ecuador, we have enjoyed traveling the Galapagos the most. Even though we’ve been there three times – we can’t wait to go back. There is just so much to experience. And so many things we want to do again. Things like swimming with sea turtles and sea lions, hiking volcanoes and snorkeling with sharks. Some of our past Galapagos photos posts: Galapagos marine iguana, pineapple plant, Galapagos flamingos and (of course) the famous blue footed boobies. Check out our set of the top 17 Galapagos books! Quito is a modern city located in the northern sierra of Ecuador. Parts of Quito remind me of a North American city (like Toronto) while other sections are more like Cuenca. Quito is a great landing spot for new visitors to Ecuador. The new airport is modern and there are lots of transportation options into the city. Is Quito safe? Well, it’s a large city so you need to be careful. We haven’t had any problems but we are still careful – as we would be in any other large city. Once, we thought that someone stole our camera in Quito. As it turns out, we had a lesson in human kindness and honesty. Best Things to Do in Quito? Something we love about Quito are all of the parks. Specifically Parque La Carolina and Parque El Ejido. You should definitely check them out! Cuenca is a great mix of the old and the new. It is has a modern airport and a downtown full of old, and (mostly) restored buildings. Cuenca has many large, well-maintained parks (Parque Paraiso and Parque de la Madre being our favorites) – and it even has a nice zoo. Here are our Top 10 Favorite Things about Cuenca. Getting around Cuenca is easy (and cheap) using city buses and taxis. Check the local news in one of Cuenca’s two daily papers. This is a short video we created to showcase the best of Cuenca. Just off of Parque Calderon is the famous flower market – one of our favorite places in the city. Just outside of Cuenca is the Cajas National Park. Salinas is one of the top beach areas in the country. It is close to Guayaquil airport so it’s accessible by a quick flight (then drive) from anywhere in the country. Salinas has two beautiful beaches. One right on the Malecon and the other one just past the yacht club (which is more private – but still open to the public). We love the atmosphere on the beach. There are food and souvenir vendors walking the beach. We’ve bought fresh seafood from a cardboard box and there are beach chairs and umbrellas to rent for a few dollars a day. There are lots of hotels and vacation rentals located right on the main road, facing the beach. There are tons of restaurants (serving amazing seafood) and a couple of grocery stores in town. Whats the beach like in Salinas, Ecuador? You might also be interested in the taxi rates for Salinas. Learn more about Ecuador’s beautiful beaches. Guayaquil is the countries largest city – both in terms of population and economic power. While we have been through Guayaquil many times, we haven’t explored it like we want to. It is on our list and we’ll be covering it in more detail in the future. Many of the international flights into Guayaquil arrive late at night – and many of the outbound flights (to the US) leave around midnight. Because of this, having a great hotel – with shuttle – is important. We stay at the Howard Johnson, which is very close to the airport. Here are some posts about Guayaquil. Whats the Guayaquil Airport Like? Although it can be very hot, Guayaquil is definitely worth exploring. There are many cultural and natural attractions to experience. And the local culture and way of speaking are notably different than in the sierra. The food in Ecuador is amazing. It’s worth traveling here just to experience it. The bakeries in Cuenca are incredible. And as a family, we especially love the seafood dishes from the coast. There’s a Guinea Pig On My Plate! During our travels in the Galapagos, we’ve seen marine iguanas, flamingos, giant tortoises, blue footed boobies and sea lions. We still have lots of photos and videos to publish about our adventures in the islands. Stay tuned! So there you have it – an overview of travel in Ecuador. Hungry for more? You should check out our site map for a full list of every post we’ve ever published. We also have a Start Here page to help you get an overview of our full site. Two of our other popular sections are: Living in Ecuador and Ecuador real estate. your website is a wealth of information…thank you. i will be traveling through ecuador for a couple of months starting late march with the intent to discern where i will relocate to in ecuador. i assume using a bus is the best way to travel from city to city but would appreciate any insight you have in this regard or websites you suggest will be helpful in planning the transport part of the trip. thx. My wife and I will be returning to Cuenca for the third time, and at the end of our trip, will be taking on an Amazon lodge/tour of some sort for five days in the first half of July. There are several lodges listed at Happygringo.com, and we’re looking for any recommendations of a good lodge/tour that is reasonably priced. We saw Sacha lodge, but is on the expensive side. Do you have any suggestions? I spent 2 weeks traveling around this amazing country and I discovered its people are just incredible, Ecuador has stunning landsacapes such as Cotopaxi, Cayambe. The province of Imbabura is one of the greatest cities with San Pablo lake and Yahuarcocha, Cuicocha. I found this operator Gulliver Expeditions in Quito they help me to plann my experience in Ecuador. Highly recommendit. I couldn’t find anything about Santa Marianita. It is kind of a hidden gem South-West of Manta. A small village with proud fishing families and barely any tourists. The beach is very very long and a local effect creates great winds to go kitesurfing. I stayed 2 months in a bamboo hostel on top of the hill overviewing the whole beach. The owners are local guy and his Belgium girlfriend. It was a great atmosphere. I can highly recommend it. I want to visit the Galapagos Islands so badly. My wife and I are planning a trip to visit, but we never considered visiting Quinto. You had a lot of good information on the cities, thank you so much! I got married two months ago and with my husband I decided to spend our honeymoon in Ecuador. It was just amazing! We loved everything about Ecuador, the culture, the people, the food, the volcanoes, the landscape, the Galapagos Islands, just everything! We looked for the most professional tour operators in Ecuador and found Gulliver Expeditions (www.gulliver.com.ec). They organized a perfect trip for us and cared about all our wishes and desires where we wanted to go. My tip for you: When visiting Cuenca, don’t miss not only the view point and the church TURI, but also the swing in the little parc next to the viewpoint, where you get the feeling of flying over the city while you can take an amazing picture! Hey what an interesting blog! I realy hope I can visit the Galapagos Islands some time, because everyone says that the islands are amazing. I have only been to Quito and I realy liked it. Hello. I want to travel to Ecuador next year sometime…I was thinking between June-August? I know that our summer is their winter, which is essentially just spring. How hot does it get between these months? I will be staying with some friends (hopefully), but how expensive does traveling by bus/taxi get? And if I can`t stay with them, what are some cheap hotels you would recommend? I don`t want to do much touring, that isn`t a major point of my visit, but what is the usual cost to go the Galapagos Islands? Have you ever been to the Amazon Rainforest? If so, how expensive is it? What about the Octavalo Markets? I`d like to bring back souvenirs for friends…what can you recommend as far as quality and price? I heard it isn`t too bad there for solo women? I am a teenage girl, and I don`t know if I`m going solo or if someone is traveling with me. Obviously be cautious anyway, but how rare is it for someone to be in potential danger…particularly a woman? What about thieves? Medical insurance? Sorry if I`m bombarding you with questions:), but I`d like to be as thorough as possible with my research. That beach (Malecon) doesn’t look appealing at all. Are there other, less developed beaches that you would recommend? Yes, just travel north towards Manta. There are many beautiful, less developed beaches. visit Los Frailes beach in Manabi, it is one of the best! Hey Bryan, awesome down to earth website. I’m loving reading your articles. I have lived in Cuenca for one year and just love it. I am planning to move to a new apartment later this month and want to know if you can suggest where to obtain cardboard boxes for packing. You can check with the supermarkets. You might have to pay for them, but they should be less expensive than new. When we moved, we just took up a bit of a box collection among friends to get them. Maybe some neighbors have some? Hi there! I have 4 kids and we are considering to move to Ibarra or Santo Domingo next year. Cuenca looks amazing for my style but we don’t have a job offers there! I have kids ranging from 13 to less than a month old….. What do you know of these two places? Or Quito? Although we are looking for a smaller and more relax town. How are the schools? and private lessons like music lessons etc??? Also how do you get in touch with some foregin families living in the area??? Some expat friends lived in Santo Domingo for a number of years and I don’t think they would recommend it for expats. Some Cuencano friends moved to Ibarra a couple of years ago and they love it. I haven’t been to either town but Ibarra looks beautiful. Spent a week in Cotacachi in July. It’s about 30 minutes from Ibarra, small and relaxed, with about 2000 expats living there. There are reasonable rent rates (less expensive than Quito or Cuenca). Luis Guevara is an excellent, very personable guide, speaks excellent English, and can help you find a place in the area. You can contact him at foreverguevara@yahoo.com, call him when you arrive: 092 229 144 (or call from the US or Canada: 011 593 922 9144. He and his wife also run a tienda right across from the bus station (on “Leather” street, facing the parking lot). Hi, I am an native from Otavalo(an indigenous town and city on the north of Ecuador, full of customs, culture and music), And if you want someone to guide you, while you visit here, let me know my friend, I speak English(no too excelent) but I enjoy to share with people our way to live, doing little trips around the towns and showing and living a full experience. PD: I do not work for any agencie. jhon5eddy@hotmail.com I am working by myself on the beggining of this, the agencies are actually too expensive. It is an illegal activity work, as indendiente guide and has sanction according to the reform of the Tourism Law in force in Ecuador. All tours must be exercised by travel agencies /tour operador. No comment on travelling around Ecuador by bus? It appears you are avoiding that. No, not avoiding it. We have a car so our experience with buses is limited. We did write about city buses and a bus trip we took a few years ago. Hello Bryan and Dena, I’m new to this cite. We have never been to Cuenca and would like to visit. What do you recommend todo in the city? We are open to any suggestions. Is it best to stay at a hotel or a rental apartment on our first visit? Will two weeks be enough to explore Cuenca? What other areas surrounding Cuenca do you recommend? I would really appreciate any advice you could offer to help us on our first trip to Cuenca. We are visiting Ecuador and are on our second week , we are leaving for Manta from Esmaralds taking our time down the coast any suggestions? We are an American family and we have been living in Costa Rica for almost one year. We are converting from Expats to Nomads this summer as we embark on a round the world trip, and our first stop will be in Cuenca for a 3 week Spanish intensive course for my children and husband. I have signed up for a call back with Simon Bolivar Spanish school, but I am concerned about finding a home stay that will take a family of four. Do you have any recommendations for affordable short-term places to stay for a family? I would appreciate any input to point me in the right direction. Sounds amazing. I don’t have contacts for homestays in Cuenca. Maybe another reader will be able to help. I’ve been enjoying your blogs. Am thinking of moving there upon retirement and want to do some exploratory travel there to get the feel. What do you suggest for an inexpensive (relatively) tour guide. I’d be more interested in seeing the “real” country than touristy attractions. What’s the best city to fly into? Is summer a rainy season? It doesn’t really matter which city you fly into – it really depends on what you want to see. Both airports are very nice and have good services for national flights and hotel shuttles. hi fellow canadian gringos abroad! i absolutely love your blog and the fabulous photos and film clips you both include! i have a question: what time of the year did you see the lively pink flamingos on the galapagos islands? i did not know they feed there… now i want to go there too, i just added it to my “wish-list” of places to go. also, the bush or tree the hummingbirds are on is an Abutilon. beautiful! i spent 10 days in Ecuador on a garden tour 3 yrs ago. i love Cuenca, gave me a good feeling. i know one day i will go back to this wondrous country. right now i am spending some time in mexico. I understand that they live there year round (although I might be wrong…). They actually are feeding in a flooded gravel pit on Isabela Island. Hi, i have a friend who moved to Equdor two years ago and likes it. He is on the beach. I would probably want to look at a cooler area. I was strongly looking at Cuenca until i read about the mold in homes. I have a huge allergy to black mold, aspergillus. So, any help you can give would be great. I also have two dogs and a cat. Would it be difficult to find a place to rent? I want to live where i can hop the buses for transportation. I lived in Mx. For a short while and loved Oaxcca( sp?) , Mx. It was 5000 ft. In the mtns. I loved it. Since i lived in Santa fe and Albuquerque, i learned i liked the lower altitude of Albuquerque which was 5000 ft. Some homes that are poorly constructed have mold problems. The climate in Cuenca is dry – if you rent/buy a well made / ventilated home you won’t have any trouble. Rentals that accept are not hard to find – only some of the security buildings have exclusions. I was worried about mold before we moved as well. None of the rentals we lived in (we’ve lived in a few) had any problems with mold. You just have to make sure you are renting in quality construction. As Bryan said, the air in Cuenca is dry. It does rain often in the rainy season, but it’s not humid. We even had to buy a humidifier to help with the dry air https://gringosabroad.com/ecuador/health-concerns-in-cuenca-dry-air/.